“Here are cool shadows and silence and stone, tile painted by the fall of light through stained glass.” James Dressler has sought refuge in the Catholic Church since his youth. It is his sanctuary from a tumultuous home life, and a place of beauty, comfort, and mystery to which he has always felt drawn. When Vestments begins, James is thirty years old and a priest a few years past his ordination, but he has begun to wonder whether this life of service and solitude is the one he wants, the one he is truly meant to lead. 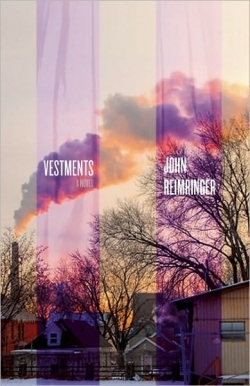 John Reimringer has published stories in multiple journals, but Vestments is his first novel. And it is a stunning debut—compelling, sharp, and rich with layers of history, family, religion, love, and everything that can wedge itself between these. Set in Saint Paul, Minnesota, this novel makes the reader feel as though one has lived in this city all one’s life, and it boasts a cast of characters as unique and fully formed as the setting. Reimringer puts the reader so deep inside James’s head, heart, and skin that one cannot help but yearn to keep reading, to reach each chapter’s surprising but inevitable conclusion. This novel has a subtle lyricism, a rhythm that pulls the reader along, and insights that shock with absolute truth. At the end of an upsetting conversation, James hangs up the phone and punches a wall. He then says, “I moved the church calendar to cover the hole until I could repair it.” This line could be a metaphor for the entire novel. For in becoming a priest, James has used spirituality and religion, the comfort of ceremony and ritual, to mask the holes his childhood created in him. But now the covering has begun to chip away and reveal what he has kept hidden—what he has been running from all his life. One need not be religious to relate to this story. Reimringer’s novel is starkly human and almost brutal in its honesty, and yet there is tenderness in it as well. It examines how a person’s upbringing influences the adult choices he makes and how he must confront those choices when he realizes they might not have been the right ones. This is human frailty thoroughly and beautifully rendered, and one would never think that each of these people was not made of flesh, blood, and breakable bone. One would never believe that the emotions laid bare, the terrifying loves unfolded within these pages were not capable of undoing us all.